For most people, Christmas Day is the eating extravaganza. But with Mr M working as well as his sister (not just a sister-in-law but a nursing sister too) we decided to recreate the food-filled family day on Boxing Day. We’re all self-confessed food lovers, so we decided to go all out with a long, lazy, multi-coursed treat that was exactly what WE wanted, without constraints of tradition or expectation. First up, a starter of Albanian Liver – yes you will have seen this earlier in the blog when we discovered while on holiday in Turkey. Yes, so it’s not conventional Christmas fare, but who cares? Sister Manning had marinated calves liver in Sumac (you’ll have to read the other post to see what this is) as well as cumin, thyme, flour, and salt and pepper. 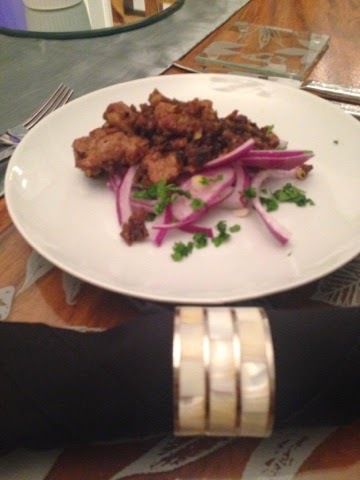 A quick flash fry in the pan with some garlic, and red onion salad to serve, and we had a great liver starter. Crispy but soft, rich and tasty, and just enough to whet the appetite for main course. 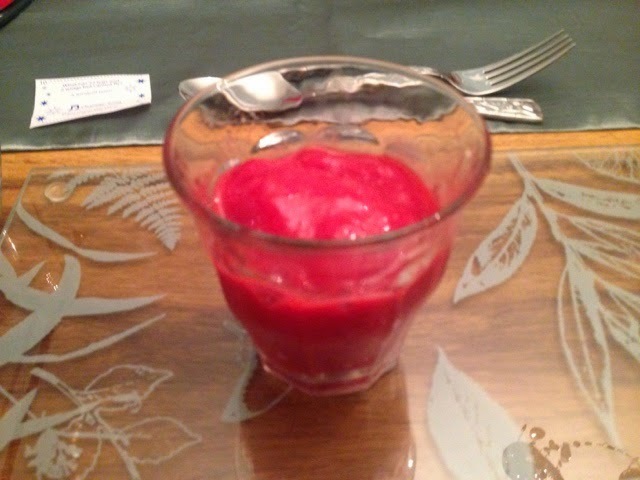 Next on the menu, a delicious palate cleanser of raspberry and pink champagne sorbet, again made by my sister-in-law’s fair hand. Sour and cleansing, it had a hint of sweet and was perfectly smooth – not an ice crystal in sight. This is only achieved by a lot of mixing as it freezes, so I’m told (or an ice cream maker that does the hard work for you). Either way, it was the perfect thing to prepare us for the main event. What did we choose for the main course? It was lamb that took centre stage at this feat. 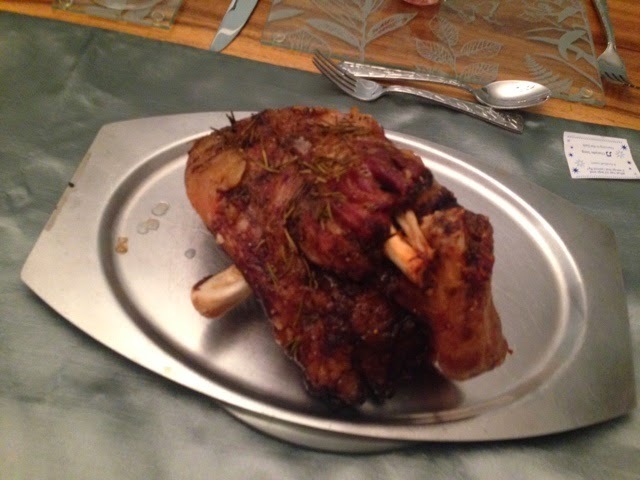 A shoulder, stuffed with garlic and rosemary, and slow roasted for more than four hours until it fell apart. This was real melt-in-the-mouth stuff, fat nicely crispy in all the right places, and deliciously melting in others. Believe it or not, I actually took part in the prep of the rest of the meal, with simply steamed Brussel sprouts and broccoli, and roasted parsnips, carrots and leeks. Mr Manning took control of the roast potatoes, and appears to have discovered a foolproof method. We all know about the tip to par boil them, then shake in the pan to fluff them up so the edges go nice and crispy. But, have you ever had the annoying moment where they go nice and crispy, but welded to the roasting tin? I know I have. The answer is to heat the oil (in our case some fat from the lamb, yum!) in the tray until it’s nice and hot, then pop the potatoes in and let them sizzle. That way the outsides go nice and crisp without sticking, resulting in crispy, tasty potatoes shells with delicate, light, fluffy middles. Add to this the Manning gravy (secret ingredient Bovril, but I can’t tell you the rest or I’d have to kill you) and there you have it – perfect roast dinner. 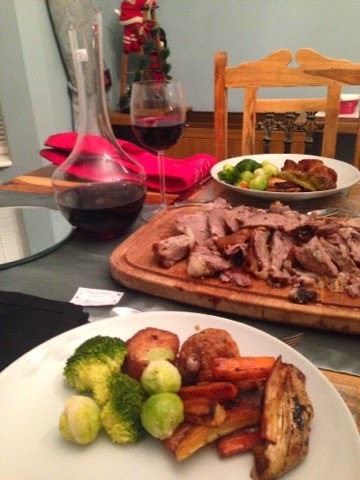 You may have heard me mentioned the falling-off-the-wagon-vegetarian in previous posts – well, not only has he now well and truly fallen off the wagon, but he was the reason there was nothing left of a whole shoulder of lamb, despite there only being four of us. Main course done, we weren’t quite sure how we could manage a dessert, but with sis’ having slaved over making part of it, and the rest of us taken part in assembling it, we had to power through and try the special egg nog dessert. 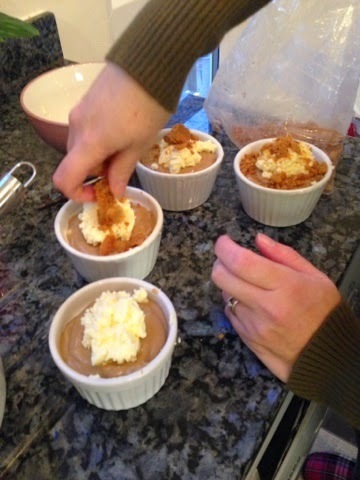 Egg nog custard, layered with whipped cream, crushed brandy snaps, and ginger biscuits. It prompted a bit of a mixed reaction, in part I’m sure to the fact we were all full to bursting anyway. For me, it was perfect. Ginger and nutmeg are great Christmas flavours, with the rich egg nog and cream adding the decadence and excess that symbolises this time of year for us food fans. Alas, for Mr Manning, it was all too much and he had to retire gracefully to the sofa. Needless to say, the rest of us weren’t far behind. All in all, it was a splendid feast. An over-indulgent, decadent party in your mouth of tastes, textures and treats. No rules, no tradition, and nothing conventional. 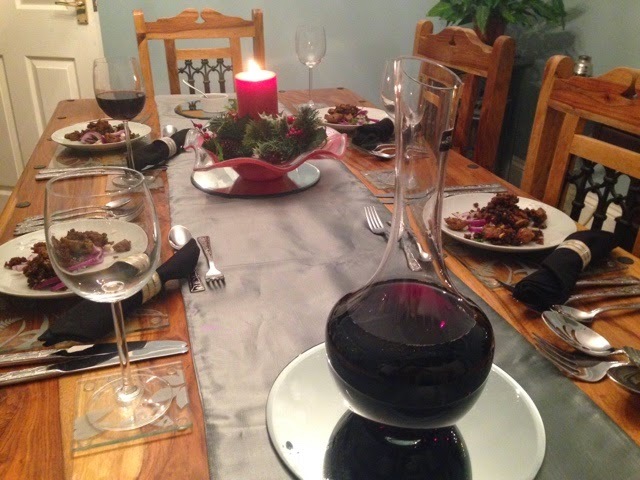 Just what we wanted, at the pace we wanted, how we wanted, all washed down with good wine and even better company. After all, isn’t that what Christmas is supposed to be all about?